A mausoleum, as defined by Ambrose Bierce in The Devil's Dictionary, is "the final and funniest folly of the rich." And the grandest mausoleum of them all is the Great Pyramid, built some 4,600 years ago by the Egyptian ruler Cheops, also known as Khufu, at the edge of the desert just outside Cairo's sister city of Giza. Final? Certainly. 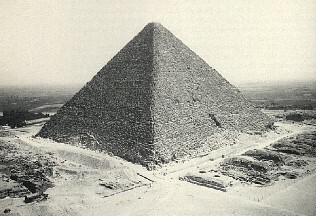 The Great Pyramid was intended to be Cheops' funerary edifice, or so many claim, although it has not been established that the Pharaoh's body ever rested within. Funniest folly? It depends on one's point of view. Ambrose Bierce, after all, was a literary imp whose first choice of a title for his irreverent lexicon was The Cynic's Word Book. Rich? Cheops had no worries on that score. His pyramid--some 480 feet high originally, and measuring 750 feet along in the base--is so large it monopolized the labors of 100,000 workers for 30 years. Pyramid-builders are a rare breed these days. But isn't it about time, in this age of technological achievement, that we build a new Great Pyramid? A pyramid of our very own, right here in the United States? Admittedly, the price tag would be high. But the task can be accomplished, and for that we have the word of Gordon H. Ball, Inc., of Danville, California, a Dillingham Corporation company whose expertise we engaged for our little architectural fantasy. Where should we build it? A geologist consulted by Gordon H. Ball suggests a site about 17 miles southeast of Salome, Arizona, an area resembling the Egyptian desert from the standpoint of climate and geology. The land there has good drainage and the underlying rock doesn't tend to crack--problems that plagued the early Egyptians. There are other advantages. This site is close to the route of Interstate 10, and not far from a railroad. In addition, travelers flying from Phoenix to Las Vegas will be able to look down and gaze upon it. At $50 an acre--a value estimated by the Yuma County assessor--we'll need $64,000 worth, which measures out to two square miles. Our next step is what construction people call "mobilization"--buying equipment, setting up camp, a power plant and workshop, extending trackage from Salome, and building and equipping a railroad yard. This is all relatively inexpensive and will set us back only S7,824,000, a sum that includes "demobilization," dismantling all the construction paraphernalia and cleaning up the site for the first onrush of tourists. Before starting their colossus, Cheops' crew had to level their construction site to within a half-inch of true horizontal, and we must do the same. Not only is excavating necessary for a firm foundation, but it would be esthetically gauche to have the finished pyramid sitting in a 15-foot hole. So the excavation must be graded over 135 acres, even though the pyramid base occupies only 13.1 acres. This means, in short, that over 3 million cubic yards of sand must be pushed around. We have just spent another $6,469,000. Fortunately, modern machinery is available for our 20th century project. We'll need 20 hoists, custom-designed for pyramid-building, to move 2 1/2-to-3 1/2-ton limestone blocks up the sides of the pyramid at a rate of 700 feet per minute. Once a stone has been lifted to the slab (the exposed level surface), we will move it into position with one of 70 rubber-tired, modified forklifts. Down below, another 50 forklifts will transfer stones from railroad cars to the base of the hoists. Between the forklifts and the hoists, it will be possible to place 2,400 or more stones daily. The capstone or pyramidion, 6 1/2 feet high and 10 feet at the base--will be lowered into place by a construction-duty helicopter. 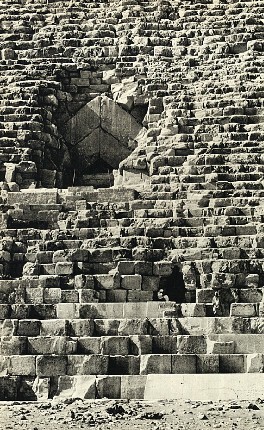 The entire modern-day operation, including maintaining and operating a railyard, and having engineering crews on hand to keep each layer of stones level, will require 405 men to do the work for which 100,000 ancient Egyptians were needed. But, of course, they didn't have forklifts. Paying all these people and running the equipment will cost us about $55,411,000. Now, about materials. Virtually all of the stone will be limestone, but instead of red granite on the apex, marble is recommended. Just about any good construction-quality limestone will do for the interior stonework. For the facing, however, the best choice is statuary buff limestone, such as that used in the Empire State Building, the Pentagon, and the Chicago Tribune Tower. The limestone will be expensive, because all dimensions must be cut within a 1/16th-of an-inch tolerance. And the closest place to find 91 million cubic feet of good limestone is near Bedford, Indiana, at a cost of $6 per cubic foot. Four quarries will be needed, operating simultaneously in cutting the stone and stockpiling it so construction can continue during the winter when quarrying cannot. We will need nearly 6 million tons. In transporting the stone from Indiana to Arizona, we can figure 1,500 stones in each trainload, and about four days to make the trip, at an estimated cost of $46.20 per ton. Adding the cost of materials and shipping together, with an allowance for managing the entire process, we come up with a total of $897,872,000. Gordon H. Ball suggests an allowance for escalation of labor expense, and a contingency sum to cover unforeseen increases in other expenses--an additional $15,295.,000. Based on a one-shift day (to avoid premium labor costs), and a construction year of 250 working days, it will take six years to build our pyramid. The first 12 months of that will be mobilization and preparation of the site, with another four months for moving out when the job is done. The actual construction will taken 56 months. The people at Gordon H. Ball wisely point out that a project of this magnitude involves substantial risk, and the odd nature of this particular enterprise makes it even riskier. Hence, a suggested profit for the contractor of 15 per cent, or $147,455,000. That puts our estimated expenditure at more than $1 billion. To be exact, a grand total of $1,130,390,000. If that doesn't buy a Great Pyramid, at least it should buy a good one.